Daily Vintage Attire, Honeymoon Edition! I’m so happy to be home after my beautiful honeymoon with my new husband, we went on a wonderful cruise aboard The Emerald Princess ship, departing from Perth November 8th, and disembarking in Sydney November 18th, where we then stayed at Oaks Goldsbrough Hotel. We had a relaxing and luxurious holiday, which I will be sharing more on in a future blog, but today I thought I’d share my daily vintage attire video for the trip. Most of the outfits I wore while away I photographed quickly before running out the door so I would be able to put together all of the beautiful vintage attire I wore to share with you all. I’ve also included each photograph and where I sourced each beautiful piece. Prior to our adventure I also visited one of my favourite places, Cherrybomb Beauty Parlour for all my beauty needs before we left, I had my hair cut and colour, nails, and lashes tended to so I’d be feeling effortlessly glamorous while away. Belt & jeans: Cherri Lane. Hair flower: Daisy Jean Floral. Blouse & faux fur: op shop find. Brooch: true vintage piece inherited. Skirt: a vintage peace which was a gift. Brooch: true vintage from my sweetheart. Dress & belt: Cherri Lane. Blouse and turban: op shop finds, from my favourite op shop Anglicare Morley. Skirt: Memory Lane’s closing down sale. Shorts: Memory Lane’s closing down sale. Dress: 1940’s dress from Gorgeous Vintage (closed now). I’ve truly enjoyed our holiday, this is the first big holiday we’ve take in over three years. I’m so happy to be home and ready to go back to working hard to make my dreams come true. I have so many exciting projects, blogs and classes to share with you all very soon! More vintage fun coming real soon. 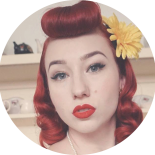 This entry was posted on November 24, 2016 by Miss Lady Lace in daily vintage attire, Pinup and tagged 1940's, 1950's, blogger, glamour, miss lady lace, miss lady laces pinup blog, perth burlesque, perth pinup, perth pinup blog, perth pinup community, pin up, pinup, pinup blog, pinup blogger, pinup fashion, pinup girl, pinup life, pinup lifestyle, pinup perth, red lips, retro blog, retro girl, retro glamour, the perth pinup community, victory rolls, vintage, vintage blog, vintage blogger, vintage fashion, vintage girl, vintage glamour, vintage perth, vintage pinup blog.